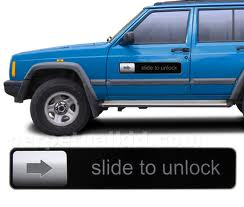 I recently saw a car with a slide-to-unlock sticker right next to the door and I immediately thought “Apple.” Although it may seem like this was just a great coincidence that Apple should be recognized for such an image, it seems they had it planned from the beginning. As most would assume, Apple won their case against Motorola in a German court earlier today, February 16, 2012. Apple evaluated three different slide-to-unlock phone system actions and the court found that Motorola was in fact in violation of two of the gestures. Although many expect Motorola to appeal the decision, Apple is sure to win and force Motorola to cancel the feature. Although this all occurred in Germany and cannot be enforced in the U.S., it is a warning to Motorola and other phone companies to stay away from anything that Apple has deemed their own. It’s always important to look at patent laws before creating something similar to something you have seen in the past. This will save you a lot of headache and a lot of embarrassment. Amanda DiSilvestro is a writer on topics ranging from social media to 401k limits. She writes for an online resource that gives advice on topics including document software to small businesses and entrepreneurs for the leading business directory, Business.com.